TKA fifth graders holding their Read to Feed goal poster. 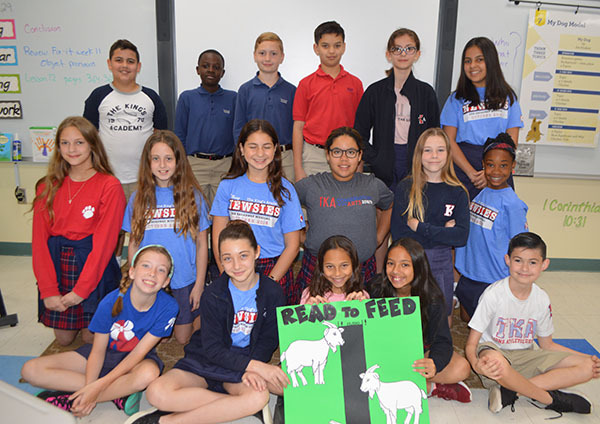 The King’s Academy upper elementary school students have partnered with Heifer International’s Read to Feed program, and the fifth graders have read a total of 22,500 pages. In doing so, they have earned the privilege of blessing a needy family in a small village with a goat. Their gift will provide a family with several quarts of milk per day. Extra milk can be used to make yogurt and cheese. Goats can have up to three kids per year, allowing families to sell the surplus and gain the income needed to send their children to school. Elementary Principal Adam Miller first introduced the program to TKA. He wanted students to do something meaningful that would accomplish several objectives. “Our shared goal is to provide opportunities for our students to gain awareness of and positively impact the global community,” Miller said.